Set to hit DS early next month. Those invaders, they never learn. First they tried to invade back in '78 and we fought 'em off. They took the fight to us, but then we whooped 'em back. Then they went all psychedelic on us and we still shot 'em in the face. Well, now they're gonna try some more of that whole trippy thing in Europe on October 2 on DS when Space Invaders: Extreme 2 launches. We'll still shoot 'em in the face. Check out the press release below and ready those trigger fingers. London (10th September 2009) – Square Enix Ltd., the publisher of Square Enix® interactive entertainment products in Europe and other PAL territories, today announces that SPACE INVADERS EXTREME™ 2 a brand new release from TAITO®, based on the classic video game franchise be released across PAL territories on 2nd October for Nintendo DS™. 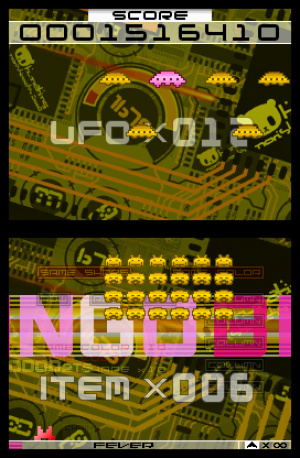 SPACE INVADERS EXTREME 2 follows in the footsteps of last year’s critically acclaimed SPACE INVADERS EXTREME, which was regarded by many as the best remake of the original classic. This year the iconic Invaders are back again and this time the action is even more extreme! The game combines the essence of the original game with a stunning alliance of futuristic graphic design and cutting-edge audio, overhauled gameplay and a whole new range of amazing power-ups. By combining the essence of the original game with a stunning alliance of futuristic graphic design and cutting-edge audio, overhauled gameplay details and a whole new range of amazing power-ups, the basic concept of the iconic SPACE INVADERS shooter from TAITO has transformed into a whole new way to take the fight to the alien invasion and get your name up in lights on the high score table! About Square Enix Co., Ltd.
Square Enix Co., Ltd. (Square Enix), a wholly-owned subsidiary of Square Enix Holdings Co., Ltd., with headquarters in Tokyo, Japan, develops, publishes and distributes entertainment content including interactive entertainment software and publications in Asia, North America and Europe. Square Enix brings two of Japan's best-selling franchises – FINAL FANTASY®, which has sold over 85 million units worldwide, and DRAGON QUEST® which has sold over 50 million units worldwide – under one roof. Square Enix is one of the most influential providers of digital entertainment content in the world and continues to push the boundaries of creativity and innovation. DRAGON QUEST, FINAL FANTASY, SQUARE ENIX and the SQUARE ENIX logo are trademarks or registered trademarks of Square Enix Holdings Co., Ltd. in United Kingdom and/or other countries. 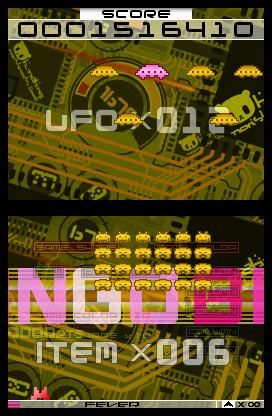 ARKANOID, EXIT, SPACE INVADERS, SPACE INVADERS EXTREME, TAITO and the TAITO logo are trademarks or registered trademarks of TAITO Corporation in the United Kingdom and/or other countries. Nintendo DS is a trademark of Nintendo. All other trademarks are the property of their respective owners. Square Enix Limited is a company registered in England & Wales under the number 3679704 whose registered office is Castle House, 37-45 Paul Street, London EC2A 4LS. I love the first one. This will be a must-buy. The first one, space inv extreme 1, is the best shooter on the ds for me. This has been on my pre-order list. Looking forward to its release. ONM reviewed it at around 80%. The content of the review sounded good as well. I loved the first game and I can't wait for this sequel! The first game had rumble pack support; any word if this sequel will have that same feature? I have the XBLA version of the first game, which I quite liked (more than the DS release). I may wait on this one to see if it also gets an XBLA release before I buy it. Mmm, day before my birthday. I'll either get it as a gift or buy it as a birthday treat to myself . I really can't wait for the NA release. I'm still playing the first title at least once a week trying to win a game without continuing as well as go for higher scores. It's a great new take on the SI franchise that I hope doesn't get milked for all it's worth. Second one is amazing, been playing the jpn one for a while.